This stamp is called Mimo with Tulip. Mimo is the sweet little boy in the Bildmalarna line. 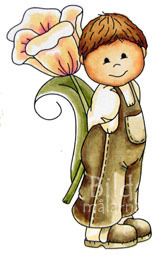 Here he is holding a pretty tulip behind his back. This measures approx. 3 1/4" tall x 2" wide.